The David Lynch film Blue Velvet looked at the strangeness that can lurk in the most seemingly ordinary suburbs. And while I promise you there’s nothing nearly as sinister as Blue Velvet’s lead psychopath Frank Booth in this totem pole park, it’s not exactly something you expect to find in Petrie, one of Brisbane’s straightest family suburbs. All the most familiar naval figures are there – the guy with a handkerchief over his face, the nurse with the dislocated wrists holding a baby, the guy in the jumpsuit with the arms that hang uselessly by his sides, and the burly totem pole sailor with no neck (left). Oh wait, none of them have necks. And of course, a sheet of iron with an anchor coming out of it really caps the whole thing off. Most of the totem poles have their backs to the traffic, which makes it hard to work out what it’s all about from a standard drive by. And for anyone you wants to visit, you’ve got to really want it. The park is set on one of the area’s busiest streets, and there’s nowhere you can stop – at least not if you want to live to see another weird totem pole park. I had to drive all the way around the backstreets, only to find out that the road that led to the reserve had been blocked off, forcing me to climb the steep hill up to it on foot (don’t worry, I was good for it). But it really makes it feel as though this is Petrie’s strange little suburban secret – Locals Only (note: there were no locals). When I saw the totem poles at Ned Kelly’s Last Stand in Glenrowan, I felt I had stumbled on to something truly unique. But now it seems like totem pole tributes are slowly becoming just part of the landscape. 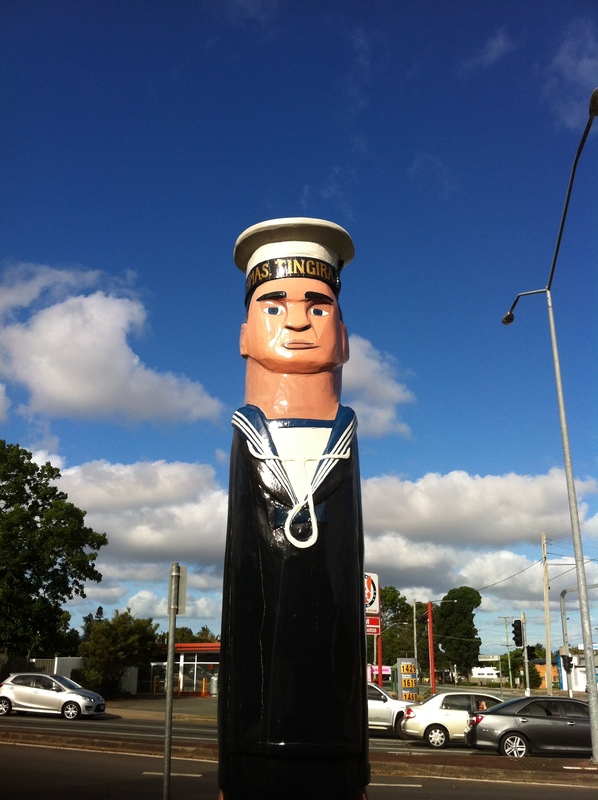 Check out these lifesaver totem poles at Geelong in Victoria. I can’t help but wonder – is there some totem pole baron out there making money from these things and laughing at us from behind the wall in his totem-pole-tribute funded McMansion?